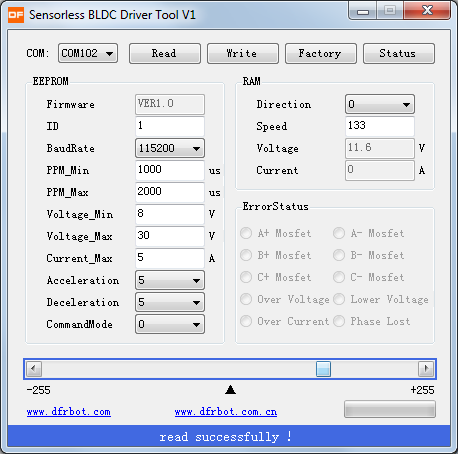 The new Veyron brushless motor controller DFBLDC(1x5A) provides 3 different kinds Input modes(PPM、UART、ANALOG) it is especially designed for brushless motors which are widely used in robotics industry because of their high-performance and good reliability. Step1: Please pay attention on "RX" and "TX". 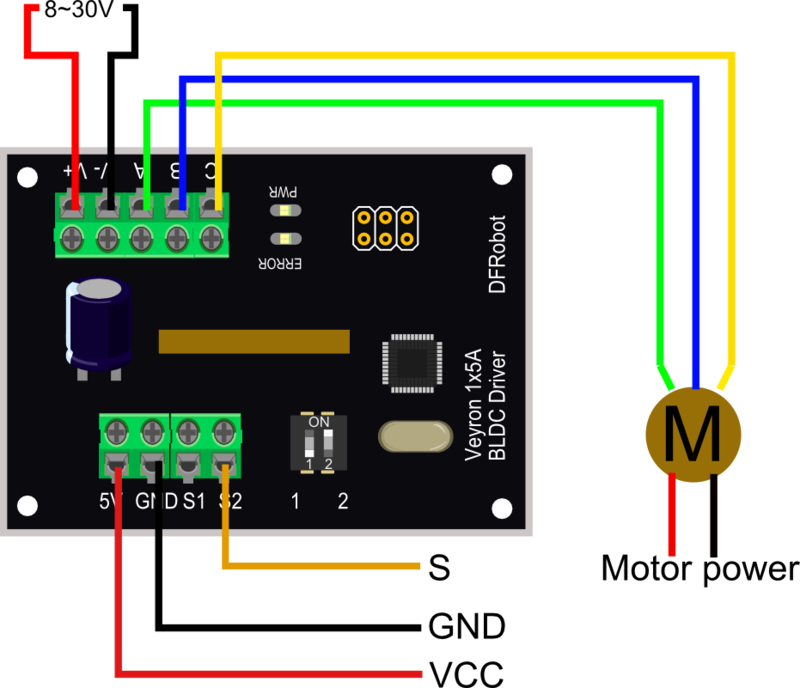 This is the connection with USB-TTL convertor. If you want to use UNO, please exchange RX and TX. Step2: Open the software, and select the correct COM port. Step3: Click "Read" to read the motor status.It will show "Read successfully" on the bottom. Step4: Move the slider to control the speed and direction of the motor. For the further detail, please check the Device Manual(Link). It is compatible with standard aero-model PPM interface, and you can also set the value of the width and the amplitude of the pulse signal yourself. Values between the minimum value and the medium value stand for clockwise rotation, and those between the medium value and the maximum value stand for counter-clockwise rotation, while the medium value stands for stop. 0~2.5V input stands for clockwise rotation, and 2.5~5V input stands for counter-clockwise rotation, while 2.5V stands for stop. It is using Arduino PWM output to simulate an analog value change. It requires 8~30V power supply(12~24V recommended), if your power is less than 8V, it will show error. Motor: please connect motor to the driver, or it will still show “error”. 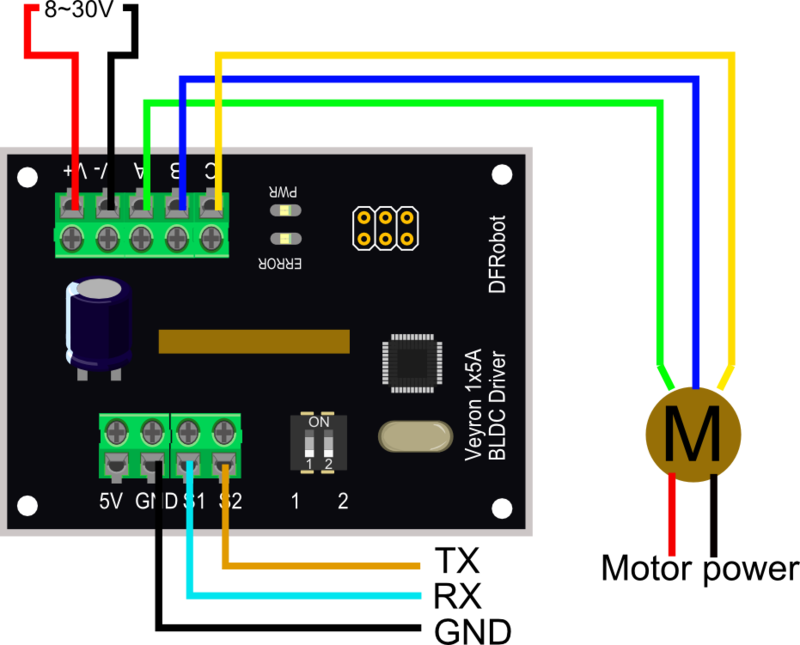 Get Veyron 1x5A Brushless Motor Driver (DRI0014) from DFRobot Store or DFRobot Distributor.